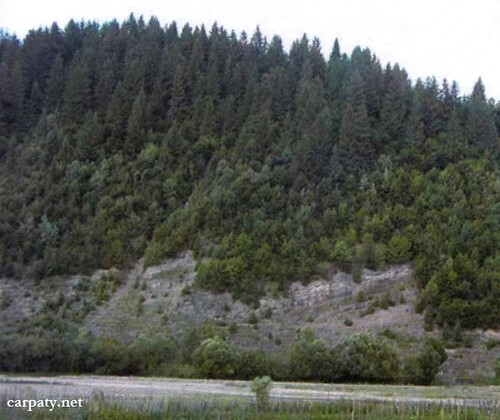 Regional Information Center "CARPATHIANS" » SOYMYNSKE EOCENE SEDIMENTS OUTCROP. 48° 34′ 18″ N lat; 23° 28′ 33″ E long. 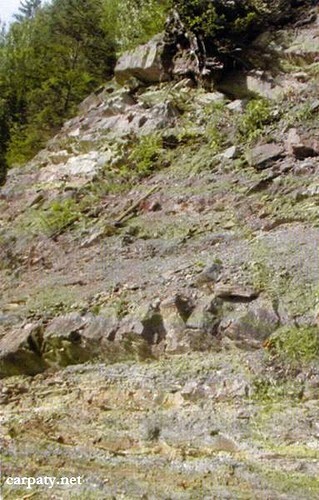 In the rocky cliffs of the Rika River left bank over the interval about 300 m long and up to 10 m height there are exposed rather uncommon for Ukrainian Carpathians Middle Paleogene terrigenous sediments (so called “Black Eocene”) composed of sandstones with argillite and aleurolite interlayers. Rock age is defined paleontologically. O.S. Vyalov had considered them as counterpart of Soymynska Suite. It is of interest because of widespread siliceous sandstones of “Shypit type” which are very like to those developed in Lower Cretaceous sediments of Duklyanska and Chornogorska Suites. Similar pile in the place of Rika and Golyatyn rivers merging forms benches in the river courses. This impressive place is being often visited by tourists. Accessible by motor-car — 550 m to north-west by azimuth 340° from the church in Soymy village. It is suggested to give the status of geological regional-rank landmark. « CLIFF “KAMYANI VOROTA” (“STONE GATES”).